Darius George dunks against UAB. George returned to action last week after missing six games with an injury. 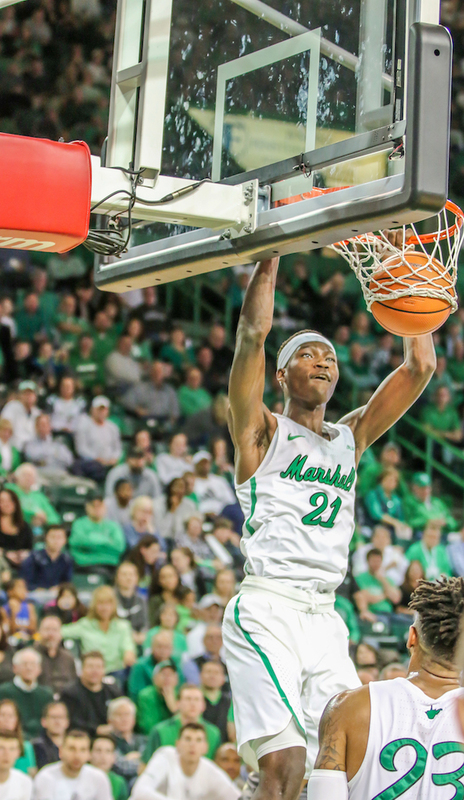 After defeating Middle Tennessee State and UAB at home last week, the Marshall men’s basketball team has its sight set on the Western Kentucky Hilltoppers. Marshall (14-6, 5-2 C-USA) will take to the road for a Saturday night rematch with the Hilltoppers (14-6, 6-1 C-USA)—but this time in a sold-out Diddle Arena in Bowling Green, Kentucky. Marshall (14-6, 5-2 C-USA) last saw the Hilltoppers in the Cam Henderson Center Jan. 6, as WKU handed the Herd its first home loss of the season, 112-87. In that meeting, the Herd was riddled with injuries. Already down freshman guard Darius George, junior forward Ajdin Penava played just four minutes before attempting to pull down a rebound and injuring his ankle. 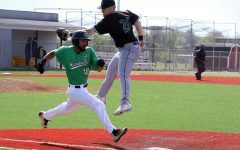 Because of injury, Penava and George were inactive on the Herd’s first Conference USA road trip this year. 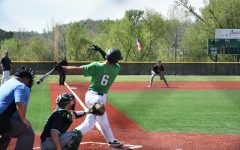 Marshall also battled illness as conference play onset. In its C-USA opener against Southern Miss, the Herd dressed just eight, as it was without C.J. Burks, Christian Thieneman, Darius George and Ot Elmore. 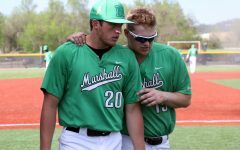 Penava has been a staple in Marshall’s effort this season. On offense, he accounts for 16.7 points per game, pulling down 9.1 rebounds to go with it. Perhaps the most eye-popping number for the Herd junior, though, are his 4.9 blocks per game, which leads the entire NCAA Division I. Junior guard Jon Elmore said the team is healing up. George missed six games with a stress fracture in his foot, including the first matchup with WKU. The freshman is averaging 4.6 points per game and 3.8 rebounds per game, a valuable spark off the bench for the Herd. After shaking off some rust against MTSU, Head Coach Dan D’Antoni said George got back in rhythm Saturday in the win over UAB.